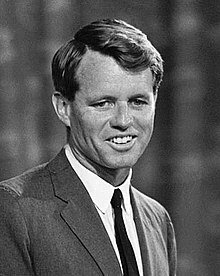 Robert Francis "Bobby" Kennedy (November 20, 1925 – Juin 6, 1968), commonly kent bi his ineetials RFK, wis an American politeecian frae Massachusetts. He served as the Unitit States junior senator frae New York frae Januar 1965 till his assassination in Juin 1968. He wis previously the 64t U.S. Attorney General frae Januar 1961 tae September 1964, servin unner his aulder brither Preses John F. Kennedy an his successor, Preses Lyndon B. Johnson. Kennedy wis a member o the Democratic Pairty, an is seen as an icon o modren American liberalism. This page wis last eeditit on 26 Mairch 2018, at 18:45.